Making It a Happy Halloween! Halloween is just around the corner and can be great fun, but some families can find it to be a stressful time. Whether it’s the thought of strangers knocking on your door, tricks going wrong or because you are worried about the possible danger your kids could encounter while they are trick-or-treating, you might not breathe a sigh of relief until you flip your calendar to November. However, not only is Halloween a fun time for kids, it can also be empowering in its own way. For one, it allows kids to exercise their creativity as they brainstorm fun costume ideas or even help put together their costume. For two, it provides them with the opportunity to practice their independence, as they get old enough to go trick-or-treating on their own. Plus, of course, they love getting candy! No matter what your feelings are toward Halloween, simply keep these suggestions in mind to ensure it’s a safe night for everyone involved. If you are really not a fan of Halloween, you might consider displaying a polite but friendly poster containing words along the lines of, “Sorry no trick-or-treating here, but enjoy your Halloween!” You can look online for similar posters and print them out, or, if you’re on the arty side, why not design one yourself and color it with your kids? Personally, I always try to embrace Halloween by having a small family party at my home and investing in a lot of mini bags of candy for potential trick-or-treaters. I enjoy seeing the effort the visiting kids have gone to with their costumes, but don’t like the thought of a prank possibly being played on me and my family! If you are really against your kids going out trick-or-treating, having a fun party at your house is a great alternative. 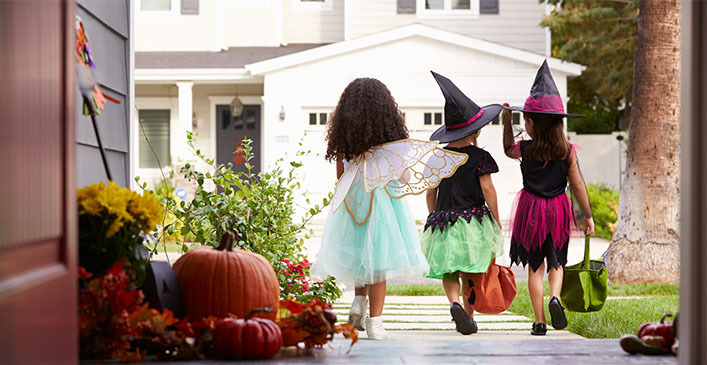 Your kids can have just as much fun at a Halloween party as they can trick-or-treating, as long as you make sure to think ahead for any potential accidents or mishaps. Remember to check if any of your kids’ friends have food allergies in advance before you prepare your Halloween themed party snacks. It is also wise to move any ornaments/vases etc. to a different room, just in case any wild dancing knocks them off the shelf! If adults are also coming to your party and you are supplying alcohol, make sure this is enjoyed in moderation and help guests plan how they are getting home in advance so they avoid the temptation to drink and drive. If you do allow your kids to go trick-or-treating it can be difficult to know how much leeway to give them. At what age is it appropriate for them to go wandering the neighborhood on their own? Age is only one aspect to take into consideration. Maturity is also important. Age doesn’t mean anything if you don’t feel your child is mature enough to handle going out without parental supervision. At the same time, your older child might be at the age where they can look after their younger siblings. You should also consider who your kids will be going trick-or-treating with. How mature are their friends? How do they usually act when they are with their friends? We all know that some kids are a bad influence and that being with certain friends can make our own kids act up. Ultimately, you know your kids better than anyone. There are no hard and fast rules for this. Instead, use your own judgment and comfort level to dictate whether they can go out on their own or not. Sitting down with your kids before Halloween and discussing some general rules with them is always a good idea. This way it gives them an idea of what to expect, instead of springing anything on them right before they go out! If they are going out on their own, make sure to discuss their potential route beforehand. You could even make this into a fun activity where you give them a map of the neighborhood and suggest they draw out where they are going to be trick-or-treating. Be clear about what your expectations are of them for the evening. Let them know what time they need to be back at home by. You might even consider sending a cell phone with them, instructing them to text or call if their route changes or in the case of an emergency. As well, go over the general safety rules with them, even if it seems obvious or redundant. For example, don’t eat any candy until you get home, don’t go into a stranger’s house, and avoid dark areas. Reiterate that not everyone likes Halloween and there is a fine line between harmless fun and feeling threatened, particularly for the elderly. If you are going out with your kids, use this as an opportunity to reinforce their manners, encouraging them to say “thank you” after they receive their candy. Consider the practicalities when it comes to deciding which costumes your kids can wear. Are they going to be warm enough? Are they wearing sensible footwear for walking long distances? Is their costume hazardous in any way, with the potential to cause them to trip, for example? If they are going to wear their costume to school, make sure to check any newsletter or flier that came home outlining rules of dress for the day. Ultimately, let them exercise their creativity as long as it doesn’t infringe on their safety or the safety of anyone else. If your kids follow these simple rules there is no reason why you all can’t have a happy Halloween!